So I’ve been on the hunt for the Pretty Pink Slalom Stripe Vinyasa all this week and made it out to a different store from my usual today but they still haven’t gotten any in, nor the Green Bean or Pretty Pink Slalom CRB’s. Seems like a limited release so far for the Vinyasa Scarf, but it will probably get widely released on Monday – by then I’ll probably have lost interest since I’ve gotten other things. 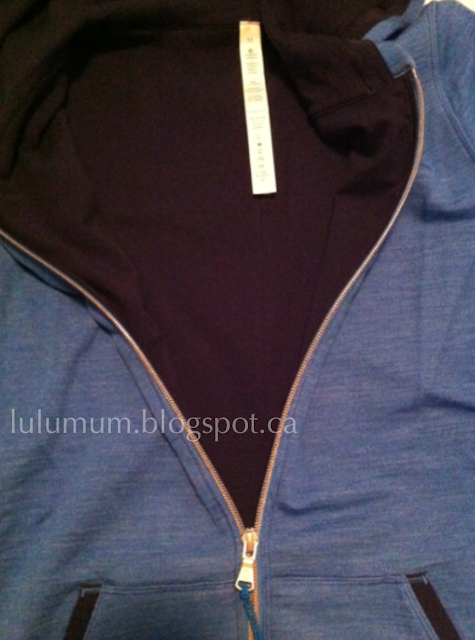 Anyways, I saw the new Cornflower Blue Harmonious Hoodie in today and had to give it a try. I was smitten with it the moment I took it off the hangar to try it on. Its got this beautiful weight and drape to it thanks to a soft inner liner made of cotton jersey (95% cotton, 5% lycra). It really reminds me of my old beloved Aura Hoodie from Spring 2011 (sadly I since sold it) which was a soft cotton jersey that felt like pajamas. I kept hoping for another hoodie to come out in that same material but they just never used it again until now. The other thing that surprised me is that this jacket is actually quite long (close to being SFT length) and slouchy fitting. Most of the pictures I’ve seen of it since Monday have been quite fitted and short so I wonder if stores are featuring this jacket sized down. I like it TTS and slouchy. The outside of the jacket is 100% Merino Wool, NOT a wool blend. Because it’s wool it has a nice texture that makes it look almost like a very fine cardigan knit. It just feels really luxurious on, warm and cozy while still feeling really light weight. I didn’t love the price of $150 with taxes but thinking about the extra special detail of the material, the cut, and how it looks on, I’m definitely wanting to keep it. 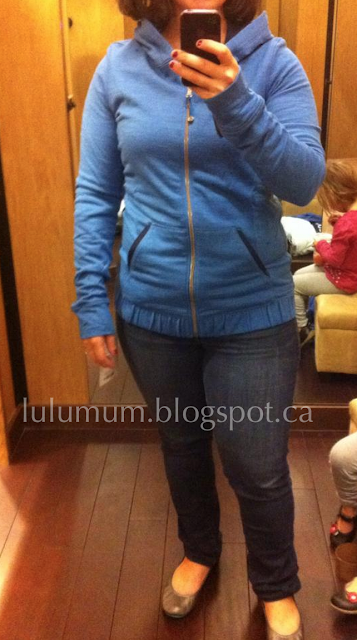 October has been pretty light on my Lululemon budget anyways. 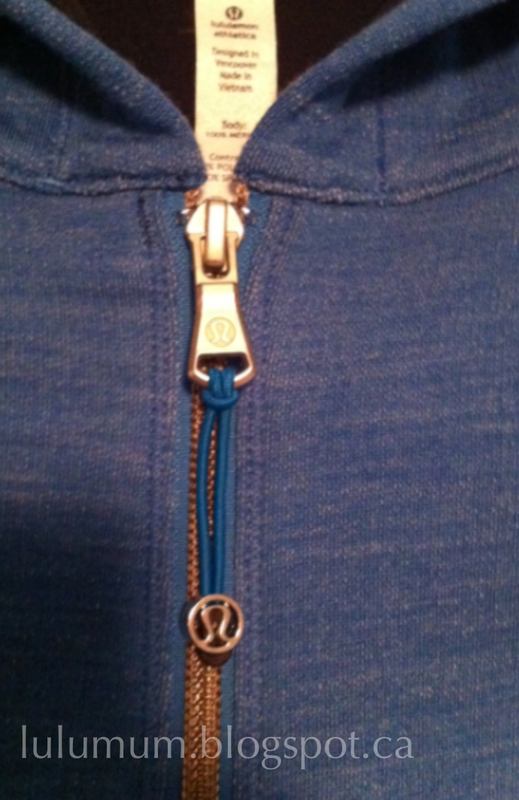 The zipper is interesting too. Its a bit more angular and it looks like platinum. You can sort of see the texture of the material here as well with the heathering. 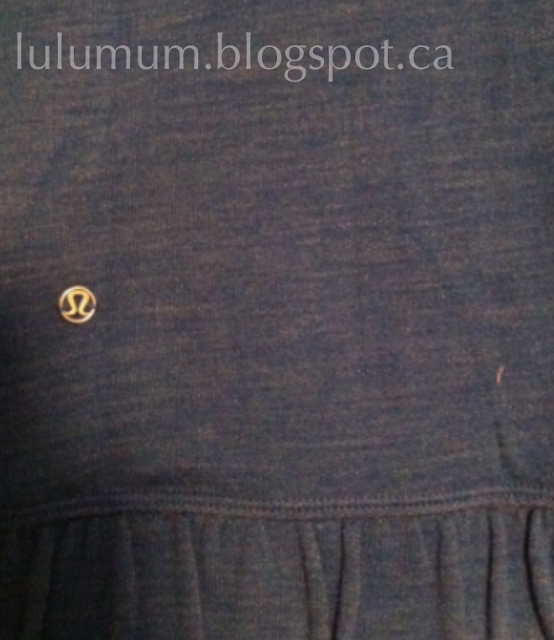 Inner liner, cotton jersey in Inkwell. No obvious logo except for the little metal logo on the back, bottom left. No hood logo. This is the Pretty Pink Slalom First Base Tank in my TTS. 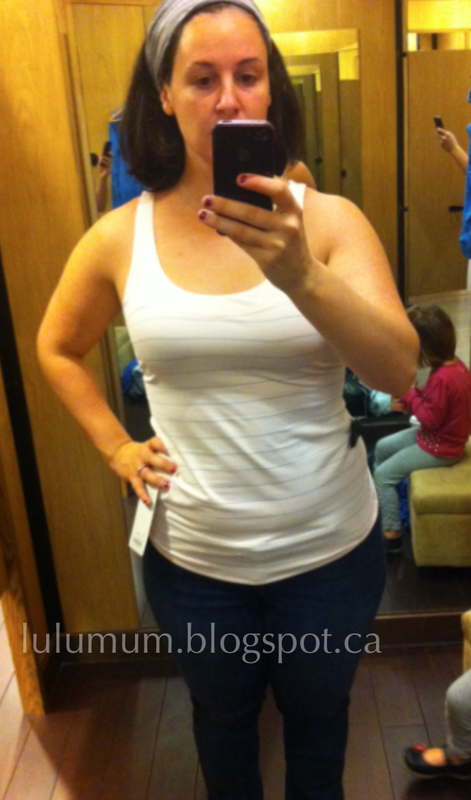 Not the loveliest with jeans but I really quite like it to be worn with none muffin top causing pants like my In The Flow Crops. The material, RULU light is very soft so it will be perfect for wearing under itchy sweaters. Its slightly shorter than CRB’s but not so much that it looks odd on my long torso. The scalloped hem isn’t a really offensively exaggerated so I’m not bothered by it. I’ve been really in the mood for a RULU light tank so I think I will keep this one as an alternative to CRB’s for crossfit, something with a little more coverage in the straps and neckline. I really like it in this color as well, it lends itself to the sweetheart neckline detailing. A New Tinted Canvas Cool Racerback Coming?